Rev. Susie began her time at St. Andrew’s in August, 2014. Prior to being called to St. Andrew’s, Rev. Susie was assisting (part-time) in charge of administration and Christian education at Intercession Episcopal Church in Thornton, Colorado. Rev. Susie was born and raised in southwestern Montana. In 1990, she was ordained a permanent deacon, serving at St. Peter’s Cathedral in Helena, Montana. After being called to the priesthood, she attended Virginia Theological Seminary in Alexandria, Virginia, graduating in 2005 with a Masters in Divinity and ordained at St. Patrick's Episcopal Church in Bigfork, Montana. 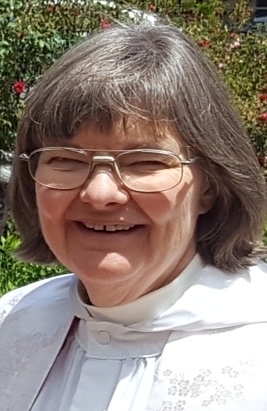 She was elected member of Diocesan Council and was appointed Diocesan Ecumenical Officer. After five years at St. Patrick's, Rev. Susie journeyed south to attend Regis University in Denver where she earned a Masters of Arts in Counseling. Eva Cavaillé-Coll our Music Director, is a very talented self-taught musician who plays the pipe organ and piano. She leads the congregation in joyful music.